Our Property welcomes everyone from all around the world, whos visiting Algeciras and the surrounded areas. This is an ideal place for any traveler on a budget. 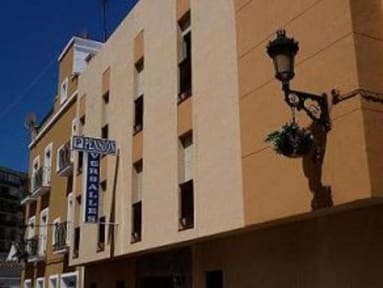 The property is ideally located in the centre of Algeciras within 5 minutes walking distance from the Train and Bus station (to the beach, Tarifa, Gibraltar) and 10 minutes from the Ferry to Tanger. The property offers an excellent environment at an excellent rate. 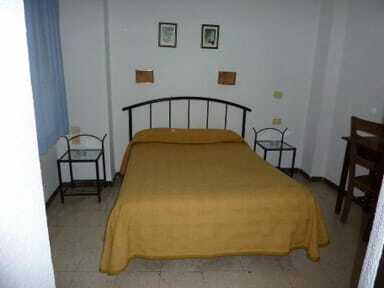 The rooms are daily cleaned and sheets and towels are kindly provided. All rooms have ensuite bathrooms, ventilator, heater and wifi access. Almost every room has a TV. We have no curfew and our reception has 24h service. The property is located in a Free parking area. Inexpensive but clean and in a reasonable spot. The staff were really friendly and kind. We got an ensuite room to ourselves and it wasn’t that bad. It was almost like a motel. Very old place but near the bus station . Easy ti find ir from There. As of the buildint... It is very old but clean and quite. For a one day stay is fije. Great location and very friendly staff, reasonable price but the heater/AC didn't work and there isn't much of an atmosphere. More or less like a motel. This place is great for the night if you keep in mind Algeciras itself dose the have much to offer. I just used the room to crash prior to getting a train in the morning. I would recommend this if you perfer quantity over quality when it comes to your stay. En suite bathroom and tv and WiFi in rooms are available. Needs a remodel. Very basic and inexpensive. The guy on reception lied about not being able to pay by card because "a cable had been cut" (due to roadworks) and the card reader "wasn't working". When I said I had read reviews of precisely this and was sick of people's lies, he changed his story. Suddenly of course I could pay by card, the machine was working, and in fact it would be doing him a tremendous favour if I *would* pay by card. Threadbare sheets, stained mattresses, in-ground dirt, noisy. No wi-fi despite saying it is included. On my second visit, the man on reception refused to take payment by card which I'd done on my first visit. I couldn't find a working cash machine so only then did he (grudgingly) accept my card. I noticed my name was only pencilled in on his guest list. With regard to the room, although the cleaners do a very good day to day clean, on closer inspection it was very grubby and could do with a good deep clean. This hostel has bed bugs. I am not surprised because this place is high key nasty. I wanted to assume the best of the staff so I thought maybe they did not know about the bedbug issue or would want to fix it. I showed my bites and photographic evidence to the woman at the desk, and she didn't even take my complaint seriously at all. She denied it, telling me it couldn't be possible that the hotel could have bedbugs. Do not stay here!!!!!! I had to bring my whole suitcase to laundromat.